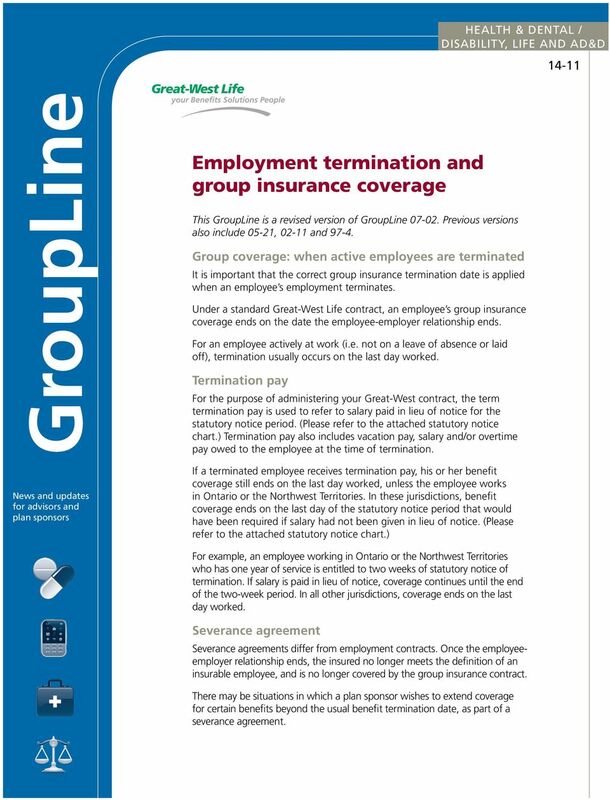 Download "Employment termination and group insurance coverage"
1 HEALTH & DENTAL / DISABILITY, LIFE AND AD&D Employment termination and group insurance coverage This GroupLine is a revised version of GroupLine Previous versions also include 05-21, and Group coverage: when active employees are terminated It is important that the correct group insurance termination date is applied when an employee s employment terminates. 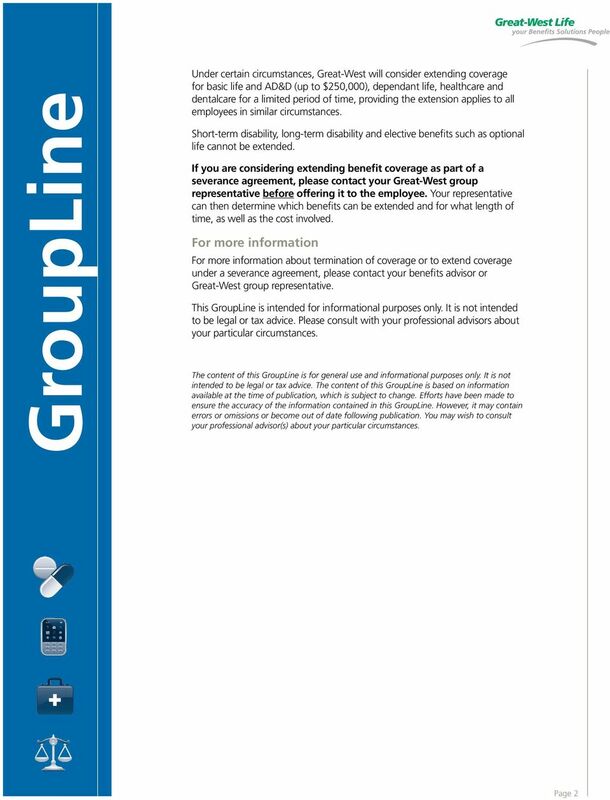 Under a standard Great-West Life contract, an employee s group insurance coverage ends on the date the employee-employer relationship ends. For an employee actively at work (i.e. not on a leave of absence or laid off), termination usually occurs on the last day worked. 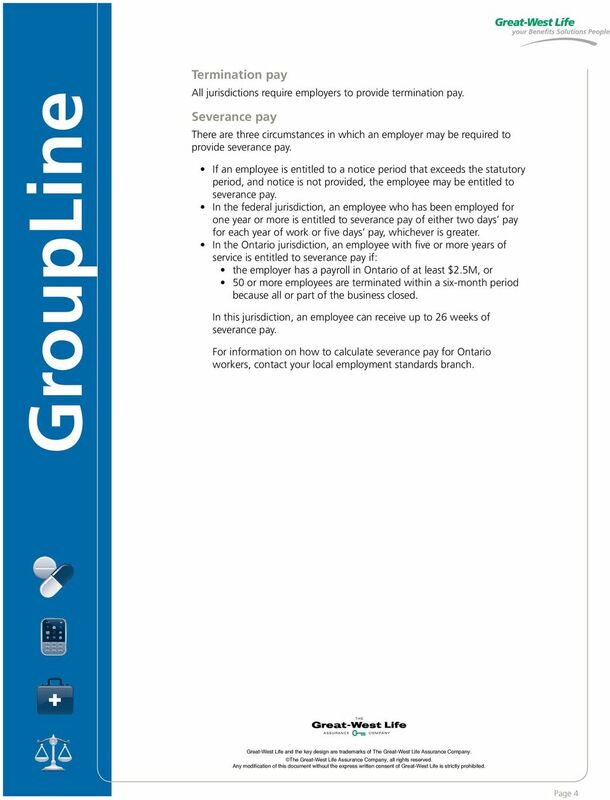 Termination pay For the purpose of administering your Great-West contract, the term termination pay is used to refer to salary paid in lieu of notice for the statutory notice period. (Please refer to the attached statutory notice chart.) Termination pay also includes vacation pay, salary and/or overtime pay owed to the employee at the time of termination. News and updates for advisors and plan sponsors If a terminated employee receives termination pay, his or her benefit coverage still ends on the last day worked, unless the employee works in Ontario or the Northwest Territories. In these jurisdictions, benefit coverage ends on the last day of the statutory notice period that would have been required if salary had not been given in lieu of notice. 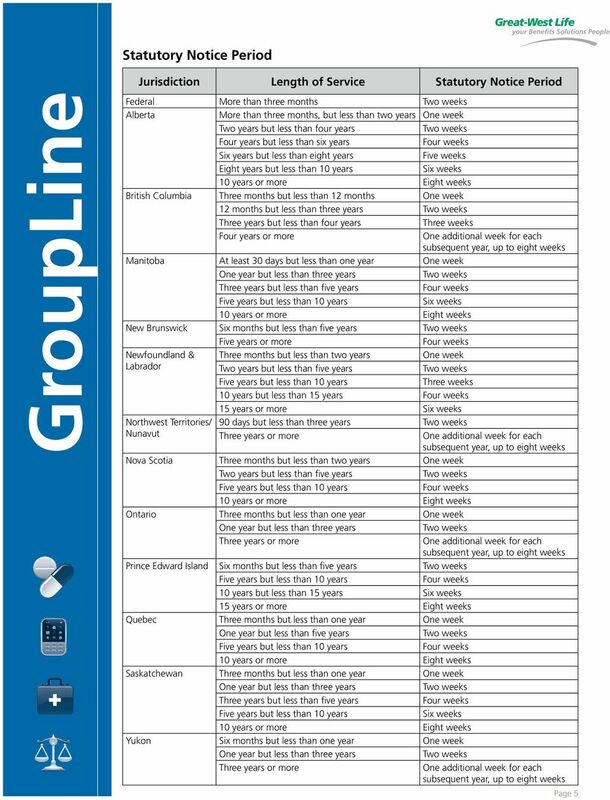 (Please refer to the attached statutory notice chart.) 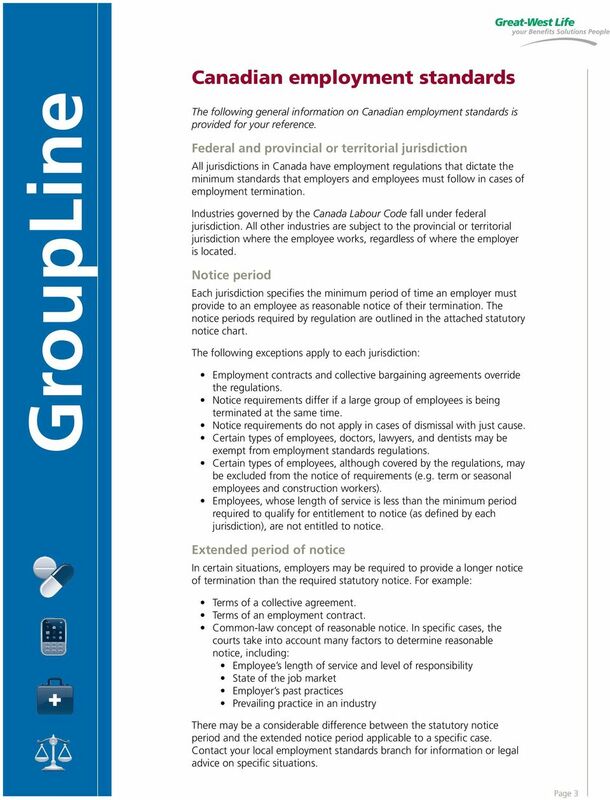 For example, an employee working in Ontario or the Northwest Territories who has one year of service is entitled to two weeks of statutory notice of termination. If salary is paid in lieu of notice, coverage continues until the end of the two-week period. In all other jurisdictions, coverage ends on the last day worked. Severance agreement Severance agreements differ from employment contracts. Once the employeeemployer relationship ends, the insured no longer meets the definition of an insurable employee, and is no longer covered by the group insurance contract. There may be situations in which a plan sponsor wishes to extend coverage for certain benefits beyond the usual benefit termination date, as part of a severance agreement. Internet Connectivity Among Aboriginal Communities in Canada Since its inception the Internet has been the fastest growing and most convenient means to access timely information on just about everything. Health and Safety - Are you in danger? Health and Safety Awareness. Why is health and safety awareness important? AND IN THE MATTER OF THE MUTUAL RELIANCE REVIEW SYSTEM FOR EXEMPTIVE RELIEF APPLICATIONS AND IN THE MATTER OF TD ASSET MANAGEMENT INC. PROHIBITED GROUNDS Prohibited Grounds of Discrimination in Canada Prohibited Ground Jurisdiction Comments Race or colour c-ccdp.ca . LABOUR PROGRAM If you have an accident What to do and how to do it LT-058-03-05 This publication is available in multiple formats (large print, audio cassette, braille and diskette) in English and French. November 8, 2011 Labour & Employment Law Bulletin Welcome back Deborah Cushing Lawson Lundell LLP is pleased to announce that Deborah Cushing has returned to the Labour and Employment Group as an associate.